First, this is certainly not an all inclusive list that covers everything that those within our arts’ community do! I’m starting with one project that was recently featured on 1350 KDIO‘s Morning Show with Julie & Adam. The Cari Me Project (click here for more info). One of our local artists, Becky Stattelman, collaborated with Make it Minnesota magazine which held a state-wide Instagram photo contest – 6 regional winners along with a grand prize winner. 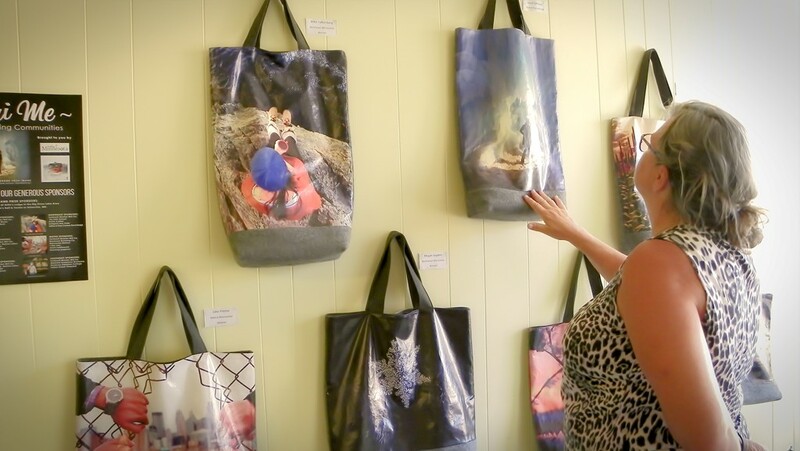 Becky made one of her tote bags with each of the winners’ photos and this display of bags then travels to each winner’s community to be displayed and used as a fundraiser for a local cause that is selected by that photographer. The grand prize winner will be displaying in their community at the Mall of America! This will be the Naomi Ballard example (she is my example – just because this MNbump blogger had a 6th grade nephew in Naomi’s volunteer school class and a niece and two nephews in one of her backyard art classes – so of course I was present and video taped these events! — Joleen’s work with our youth has been just as wonderful – I just do not have video!) I’ll start with Naomi’s 6th Grade Art class in Ortonville which was a completely volunteer teaching commitment. Upon completion of the class, the students held an evening art event to display their projects. It was so much fun to walk through the exhibits and talk with each of the students – as they explained their projects and the techniques that were used – it was impressive to hear what they had been taught – and equally impressive to see the excitement of the students as they talked about their work! The 6th grade class had some funds left over from their lollipop sales – and they wanted Naomi to have this money to reimburse her for some of the supplies that she had provided for the class! Awesome students! The first video below was from the 6th Grade Art Event and the second video was taken at one of Naomi’s backyard art classes. 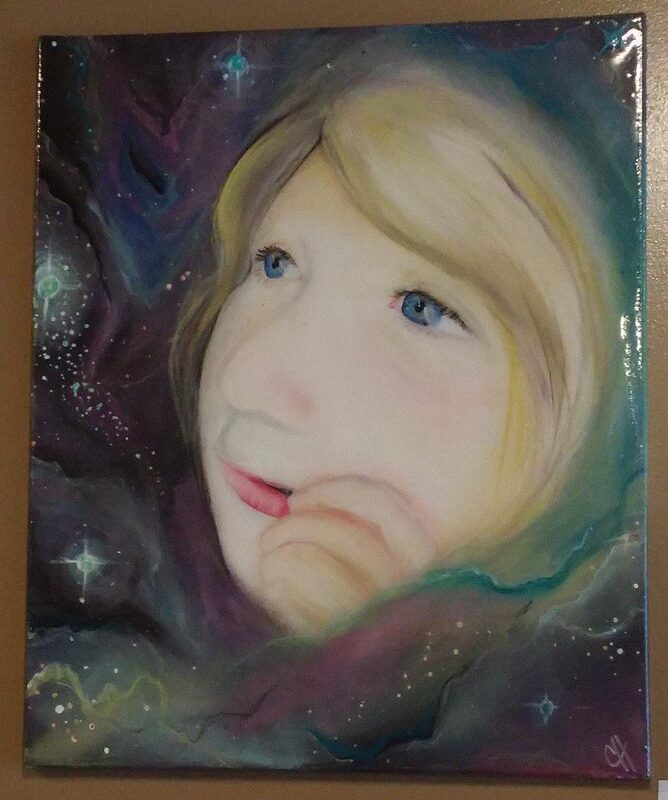 For the 2016/17 School year in Ortonville, Becky Stattelman’s “Cari Me” project donations will be used to help pay for art supplies for elementary art (half of the donations will be going to Ortonville with the other half to the Clinton-Graceville-Beardsley school); the Big Stone Arts Council is helping through a SMAC grant; the Ortonville School Foundation will be providing funds for supplies during the first half of the school year and a Thrivent grant was applied for (by Annette) in the amount of $250 which will also be invested in the youth art program in Ortonville this school year. A huge shout out to both Naomi and Joleen for sharing their love of art with our youth! If you stop at the Little Spoon in Ortonvillle, you will find a beautiful display of Callie Howell’s art. Aliza Anderson’s is currently on display in the Rotunda of the courthouse. During Cornfest in August, 48 youth took part in the Squirt Gun Painting Project. The Big Stone Arts Council provided 48 canvasses and the quirt guns – and Naomi Ballard supplied the paint and the instruction. Sounds like the class was quite a hit! The Big Stone Arts Council provides supplies and talent for activities during annual events such as Cornfest, Lake Days, Downtown Festival, the Meander and at the Sports & Leisure Show. September 30, October 1 & 2 — We have 12 artists at three locations participating in the Upper Minnesota River Art Crawl (we call the Meander!) – This is a free self-guided tour of artist studios featuring 45 local artists from the Upper Minnesota River Valley. The event has more than 33 individual studios in and near the western Minnesota communities of Ortonville, Appleton, Madison, Milan, Dawson, Montevideo and Granite Falls. (the included link above will take you to the map). That was a very brief list in answer to “What do our local artists do” – I think you can get the picture they are very involved – and will likely be one of the first in our communities to reach out to a visitor or someone new moving to the area just say say “hello” and “welcome”! As for an example of a larger on-going project, the City of Ortonville has donated 100′ of lakeshore along with the old brick water plant building to the Big Stone Arts Council (BSAC). BSAC is currently focused on the renovation of this building for a community/art center. The center will be a multi-purpose venue providing gallery space, a classroom, a large room that will accommodate 130, a catering kitchen, office, restrooms and lobby. The building has been designed and the next step is to begin fund raising. They will soon be sharing the progress of their activities and their progress on the Water Building Project on social media and websites – with the help of their new intern, Abby Guggisber, from the University of Minnesota Center for Small Towns! Next PostHousing is Available in Big Stone County, Minnesota! – Check out Ortonville!